Left Front candidate from West Tripura constituency Shankar Prasad Datta filed his nomination paper to the Returning Officer here on Tuesday. 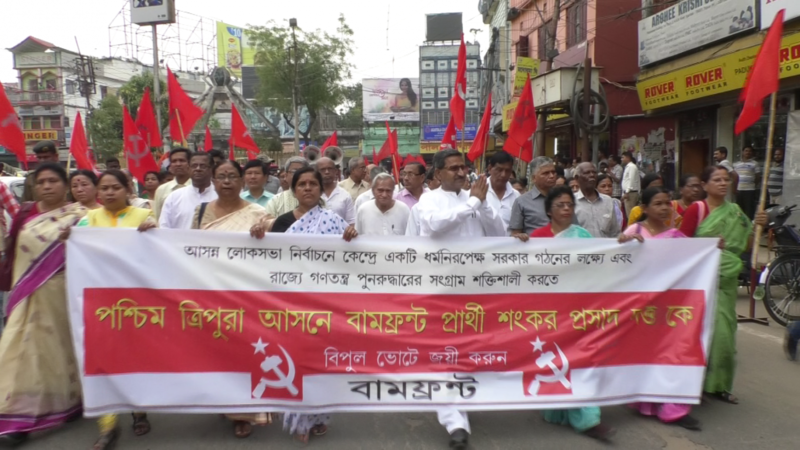 Before submitting his nomination papers, Datta participated in a procession by CPI (M) which traveled in different parts of the capital city. The 63-year-old leader, who is general secretary of Tripura unit of CITU and former CPI (M) MLA and youth leader is first to file papers in the state which is going to witness a two-phase election. Attacking on the ruling BJP at the center and in the state the CPI (M) candidate also a sitting MP from the seat expressed that Modi the government did not keep its promises and to form a secular government at the centre the Left is fighting. He also said that there should be a congenial atmosphere for a peaceful election in the state and the Election Commission should ensure it. According to the CPI(M) leader other issues like price hike, unemployment, poor scenario in the agriculture sector and corruption will also, play a vital role against the ruling BJP. Election to the West Tripura constituency is slated for April 11 while April 18 is marked for the poll in East Tripura (Tribal Reserved) constituency. The CPI (M) is ahead of opposition parties in campaigning in both the segments while the ruling BJP and Congress are yet to declare their candidates. Nearly 13 lakh voters are eligible to exercise their franchise.